#181. Lake Marian, Humboldt Mts. 10 x 20, oil on canvas. "Gilbert Munger 1871" lower right; "Lake Marian, Humboldt Mts" reverse. This painting closely matches Plate II in Systematic Geology (see #145). 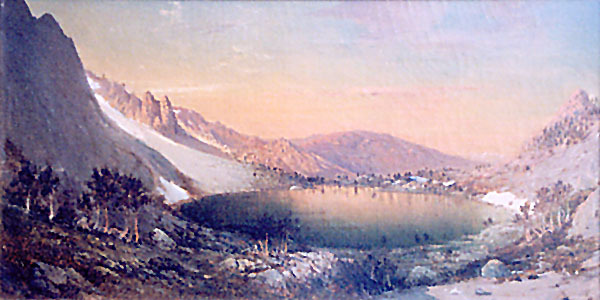 The frame shows a brass plaque with "Lake Marian, Humboldt Mts, Gilbert Munger". An envelope attached to the back contain the remnants of a paper label with "1871 No. 27". The label likely comes from the third annual exhibition of the Yale School of Fine Art in 1871, where the painting was shown. 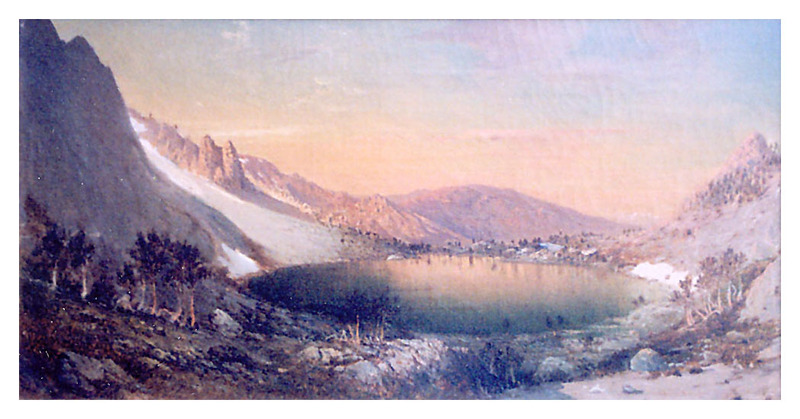 This is the only Munger "Lake Marian" painting that has come down to us still associated with the correct title. From a dealer in Minneapolis MN to a private collection in about 1975. Image from owner's photo.